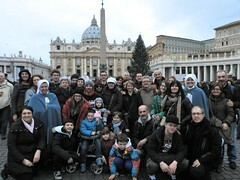 Pilgrimage to Rome with the parish of Brignano Gera d’Adda, Bergamo (Italy), from December 26th to 29th, 2013. 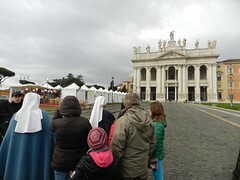 The Servant Sisters of the Home of the Mother of Brignano, Bergamo (Italy) organized, together with the parish, a pilgrimage to Rome for families from December 26th-29th. With the motive of the Year of Faith, the Holy See recommended and encouraged the pilgrimages to the Holy Land and to the Eternal City, which is the center of Christianity. We had been wanting to do this and did not wish to renounce it before the year 2013 would come to a close. With a pilgrim’s spirit, desiring to visit the places where our faith was strengthened and consolidated, we left on December 26th, feast day of Saint Stephen, first martyr. Our first stop was the catacombs of Saint Calixtus. There we were able to visit the place which had been a Christian cemetery, excavated in soft earth that was solidified upon the contact with air. The Catacombs are extended several kilometers underground and there 500,000 christians were buried, including popes, martyrs and faithful, also children, since the Christians were the first in recognising their dignity. Some tombstones and paintings are also conserved which demonstrate that for the Christians, death was not the end, but rather a necessary step to reach eternal life, obtained through Christ. The firm faith of the first Christians in the resurrection is clearly seen. We were blessed to be able to celebrate the Mass in that very place. That same day we visited the basilica of Saint Paul Outside the Walls, something very meaningful, since the fruit of the martyrdom of St. Stephen was without doubt the conversion of the great apostle of the gentiles. After praying before the tomb of Saint Paul, we prayed together the hymn that he himself wrote: “Christ Jesus, though he was in the form of God, did not regard equality with God something to be grasped...”. On December 27th, feast day of the Apostle and Evangelist St. John, the masculine branch of the Home of the Mother of the Youth celebrated their 30 years of existence. By the providence of God, we celebrated Mass in the crypt where the popes are buried, right in front of the tomb of St. Peter, in the same place where the HMY started, and we were able to offer a special prayer to the Lord for them, giving thanks for their existence and asking that they may grow in number and in sanctity. 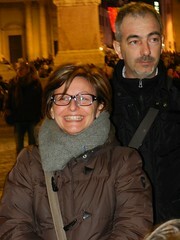 We dedicated the morning to visit the great vatican basilica, a work of art and, above all, of piety. In the afternoon, we went though the roman streets through wich so many saints have passed throughout history and “visited” some of them: St. Monica, whose remains are in the basilica of St. Augustine; St. Catherine of Siena, in Santa María sopra Minerva, and St. Ignatius of Loyola, in the church of Gesú. In this last church there is also kept the right arm of St. Francis Xavier, with which he had baptized thousands of people. Thanks to the wonderful explanation of the vicar, Fr. Francesco, we could better appreciate and enjoy the paintings of the vocation, martyrdom and inspiration of St. Matthew painted by Caravaggio and exposed in the church of St. Louis of the french. It was a calling to recognise the action of God in our lives and in his Word. On December 28th, the last Saturday of the year, we couldn’t do otherwise than dedicate it to Our Mother, the Blessed Virgin. We began the day with Mass in the basilica of Mary the Major, and also visited Holy Mary in Trastevere – two beautiful temples, the oldest dedicated to the Mother of God – and finished in the church of Santa María del Popolo. 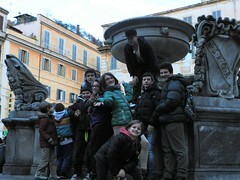 The same day we also visited the churches of St. Peter “in vincoli” and St. Cecilia. In the Coliseum, a theater consecrated to the Passion of Christ since the 9th century, we remembered the Christians who faced death without denying their faith. Before finishing our pilgrimage, we were able to participate in the Angelus that every Sunday the Holy Father prays with the faithful in the Vatican square. It is a great excitement for the pilgrims to see the Holy Father and it was beautiful to hear from him a “greeting to every family present”. It was exciting to listen to the words of Pope Francis and pray with him and with the multitude that had come to the square, and a good conclusion for our pilgrimage. 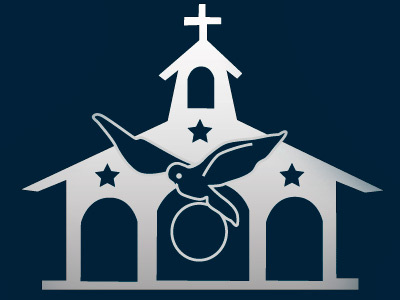 We entrust the fruits of these days to Our Blessed Mother.